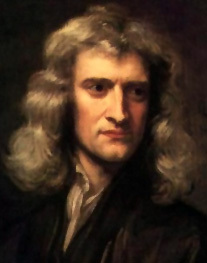 Sir Isaac Newton was an English philosopher whose laws of gravity and mechanics ruled science for 300 years. That … one body may act upon another at a distance through a vacuum, without the mediation of anything else, by and through which their action and force may be conveyed from one to another, is to me so great an absurdity, that I believe no man who has in philosophical matters a competent faculty of thinking, can ever fall into it. It is indeed a matter of great difficulty to discover and effectually to distinguish the true motions of particular bodies from the apparent, because the parts of the immovable space in which these motions are performed do by no means come under the observations of our senses. … a power of resisting, by which every body, as much as in it lies, endeavors to preserve in its present state, whether it be of rest, or of moving uniformly forward in a straight line. Absolute, true, and mathematical time, in and of itself and of its own nature, without reference to anything external, flows uniformly and by another name is called duration; relative, apparent, and common time is some sensible and external (whether accurate or unequable) measure which is commonly used instead of true time; such as an hour, a day, a month, a year. The effects which distinguish absolute from relative motion are the forces of receding from the axis of circular motion. For there are no such forces in a circular motion purely relative, but in a true and absolute circular motion, they are greater or less, according to the quantity of the motion.